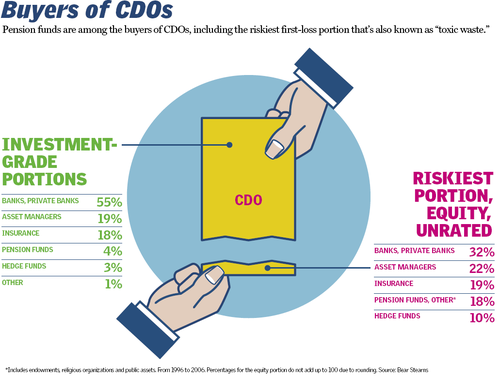 Barry Ritholtz gave some helpful tidbits about CDOs on his blog, The Big Picture. The source is the Bloomberg magazine (unfortunately only for those with terminals can subscribe). “Worldwide sales of CDOs—which are packages of securities backed by bonds, mortgages and other loans—have soared since 2003, reaching $503 billion last year, a fivefold increase in four years. 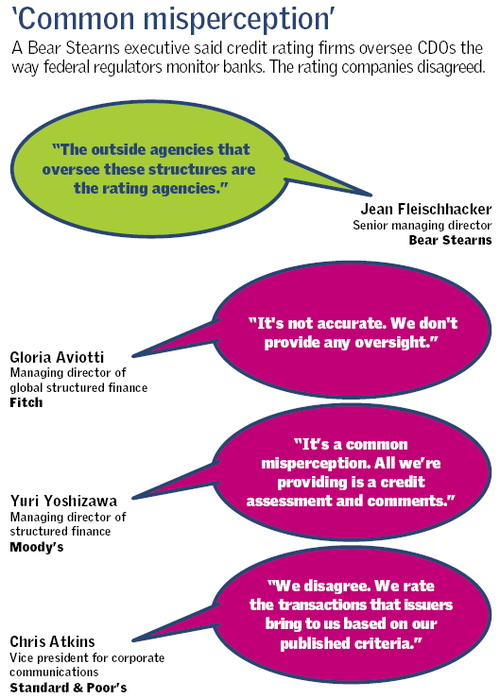 Bankers call the bottom sections of a CDO, the ones most vulnerable to losses from bad debt, the equity tranches. They also refer to them as toxic waste because as more borrowers default on loans, these investments would be the first to take losses. The investments could be wiped out. . .
Ritholtz was also struck by their use of antic graphics. I was surprised to learn how little was owned by hedge funds (the press has made them seem like much bigger buyers than they have been) and how much has been bought by parties that really ought to know better, particularly fiduciaries like pension funds (recall Pimco chief Bill Gross’ warning that even investment grade CDOs are pretty trashy). This entry was posted in Banking industry, Credit markets, Hedge funds, Investment banks, Risk and risk management on June 29, 2007 by Yves Smith.